Steven Gerrard refused to make any excuses after England’s 2-1 defeat against Italy, but said he thought the Three Lions were unfortunate to come away with nothing after a positive display. Goals from Mario Balotelli and Claudio Marchisio were enough to secure three points for the Azzurri in the opening game of Group D.
Daniel Sturridge pulled England level two minutes after Marchisio’s opener. However, Balotelli’s 50th-minute header proved decisive as Roy Hodgson’s men – despite having a number of chances to add to Sturridge's strike – were unable to find a second goal. Gerrard said: “Italy are a good team. We knew how they were going to play and they never surprised us really – but it’s disappointing because we’ve put so much into it and we’ve come away with nothing. “No matter what the conditions were tonight it was always going to be tough playing against Italy. Yes it was very warm, it was sticky and the pitch was a tough pitch because it was dry and it was moving under foot. Roy Hodgson’s side enjoyed significant spells of attacking dominance throughout the encounter, but failed to turn the dominance in goals - and Gerrard said England need to be more clinical if they are to progress. “We got criticised three years ago for sitting back and being a bit toothless really – but I think anybody who watched that game could that we were trying to create,” he said. “We pushed and pushed and gave it everything we’ve got and we were unlucky not to get anything out of it. “The chances were there and we created them. Maybe we’ve got to look at trying to finish a few more chances off. But we can’t point any fingers because everybody has given absolutely everything they’ve got tonight. “The effort, the desire, commitment was there – it’s just maybe a little bit of quality in the final third. 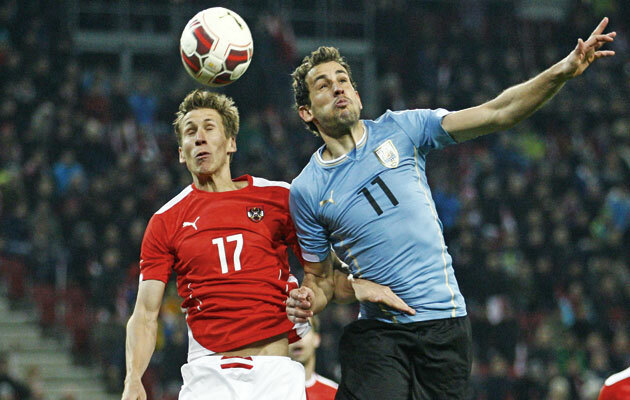 Following Uruguay's 3-1 defeat against Costa Rica earlier in the day – the pair’s meeting on Thursday becomes pivotal. But despite the defeat Gerrard remained upbeat about England’s chances of progressing. “No matter what the result was tonight we were still going to have to go and beat Uruguay,” he added. England take on Uruguay in Sao Paulo at 8pm BST on Thursday 19 June. Lucy Bronze hopes her maiden England goal, in the 3-0 win over Belarus, will be “the first of many”. Centre back Bronze, who was named the PFA Player of the Year in May, crashed home an angled drive in added time to complete the Three Lions’ seventh straight victory in World Cup qualifying. And after the game in Minsk, the 22-year-old was interviewed for FATV by her defensive colleague Alex Scott, who is currently studying for a degree in sports journalism. Bronze said: “It was a good result for us, another clean sheet and another few goals – one from me [which] was especially brilliant. “I’ve been working on my strikes across the goal in training and it just came off. Phil Jagielka believes that if England show the same attacking intent they did against Italy in their next two group games they will progress to the knock-out stages of the World Cup. Despite suffering an unfortunate 2-1 defeat against Italy in their opening Group D game, Jagielka said England will bounce back quickly against Uruguay on Thursday. The Three Lions narrowly lost out to the Azzurri after Mario Balotelli’s second-half strike proved decisive. But according to the Everton defender there were plenty of positives to take into the game against Uruguay – with attention turning to Thursday’s clash. “The feeling in the dressing room is one of disappointment right now,” he added. “We’ll fly back to Rio – have a cool down day tomorrow. We’ll look at some video footage of the game and try and take some of the positives out of it. Former Premier League star Balotelli headed home the winning goal on 50 minutes after Antonio Candreva whipped in a dangerous cross and the AC Milan striker headed home past former Manchester City team-mate Joe Hart. England continued to rally, however, and a string of missed opportunities and a series of good saves from Salvatore Sirigu has Jagielka ruing what might have been. “We thought we would have had long enough to get back into the game,” he added. Next up for England are Uruguay, who they face at the Arena de Sao Paulo on Thursday 19 June. The game kicks off at 8pm BST. It took a resolute second-half performance from Italy to edge out England in their opening Group D game at the World Cup in Manaus. Roy Hodgson’s men will think themselves unlucky not to have earned a draw, enjoying the lion’s share of goal attempts after Claudio Marchisio gave Italy the lead. Daniel Sturridge levelled almost instantly, but former Manchester City man Mario Balotelli headed a winner early in the second half to get Cesare Prandelli’s side off to a winning start. After almost eight months of talk and anticipation since the win over Poland, the waiting finally was over as Hodgson’s side took to the Arena Amazonia pitch. Livewire winger Raheem Sterling was given the nod to start in place of Adam Lallana who played against both Peru and Ecuador. And it was the Liverpool man who almost gave England an early lead with a rasping drive that had Italy’s second-choice keeper Salvatore Sirigu well-beaten only to ripple the side-netting. His Reds team-mate Jordan Henderson tried another fierce drive moments later, but this time the Paris Saint-Germain stopper – an 11th-hour change for the injured Gianluigi Buffon – beat it away. Danny Welbeck tried to make the most of a misplaced clearance, but dragged another strike wide from 20 yards. Italy, though, were enjoying much of the early possession, progressing forward in numbers through the middle with support coming from wide, particularly Matteo Darmian on the right flank. Italy were slow and patient, as the Three Lions closed the gaps to deny the space. When England won the ball back, their breaks were quick and with purpose. Joe Hart was called into action midway through the first half when Antonio Candreva belted a shot goalwards, which bounced up in front of the Manchester City man making it difficult to deal with. Phil Jagielka was on hand to mop up. Hart’s former team-mate Balotelli then sprung to life, firing goalwards when in space, but that was off target. England, though, were having joy getting in behind the Azzurri rearguard and it took a last-ditch slide from Gabriel Paletta to deflect a dangerous Welbeck cross, destined for Sterling six yards out, away for a corner. Then Marchisio opened the scoring and put Italy in charge. Andrea Pirlo let a corner run to his Juventus team-mate in a central position 25 yards out and he took one touch before drilling expertly into the corner of Hart’s net. 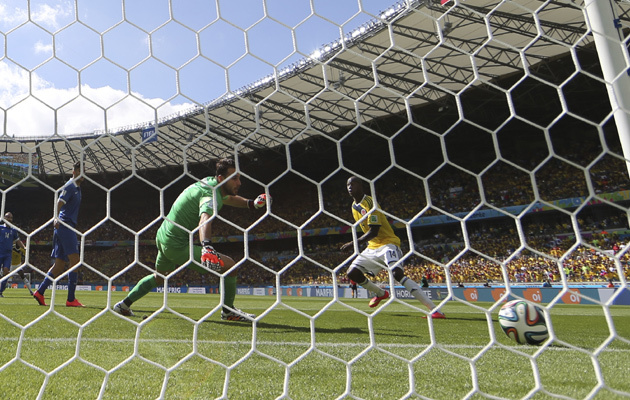 Within two minutes, though, England responded as Sturridge tucked away from close-range. Wayne Rooney’s cross from the left had turned the Italian defence, the Liverpool striker applied the finish and he peeled away to perform his now-famous dance celebration. The game swung back into Azzurri’s favour five minutes after the break. England had come out positive, but an attack on the right from Candreva, who cut inside to cross, found Balotelli unmarked at the far post to nod home. Hodgson’s men were creating openings and Wayne Rooney came close, dragging wide after a neat more. Then the lively substitute Ross Barkley gave Sirigu something to deal with down low to his left. Glen Johnson also tried a shot on goal, while Baines forced another save with a dipping free-kick as England strived for an equaliser. Italy retreated into their half, as their attentions turned to stopping Sterling and Sturridge by any means necessary. Late efforts from Gerrard – another free-kick – and Rooney were in vain, while Pirlo’s injury time free-kick crashed off the crossbar. The defeat will be a setback to England, although their attacking pace and flair will certainly give Hodgson something to be feel positive about as he plans for Uruguay on Thursday. England (4-2-3-1): 1 Joe Hart; 2 Glen Johnson, 5 Gary Cahill, 6 Phil Jagielka, 3 Leighton Baines; 4 Steven Gerrard (C), 14 Jordan Henderson; 19 Raheem Sterling, 10 Wayne Rooney, 11 Danny Welbeck; 9 Daniel Sturridge. Substitutes: 21 Ross Barkley (for Welbeck) 62, 7 Jack Wilshere (on for Henderson) 73, 20 Adam Lallana (for Sturridge) 79. Substitutes not used: 13 Ben Foster (GK), 22 Fraser Forster (GK), 8 Frank Lampard, 12 Chris Smalling, 16 Phil Jones, 17 James Milner, 18 Rickie Lambert, 23 Luke Shaw. Italy (4-1-3-1-1): 12 Salvatore Sirigu; 4 Matteo Darmian, 15 Andrea Barzagli, 20 Gabriel Paletta, 3 Giorgio Chiellini; 16 Daniele De Rossi; 8 Claudio Marchisio, 21 Andrea Pirlo, 23 Marco Verratti; 6 Antonio Candreva; 9 Mario Balotelli. Substitutes: 5 Thiago Motta (for Veratti) 57, 17 Ciro Immobile (for Balotelli) 73, 18 Marco Parolo (for Candreva) 79. Substitutes not used: 13 Mattia Perin (GK), 7 Ignazio Abate, 10 Antonio Cassano, 11 Alessio Cerci, 14 Alberto Aquilani, 19 Leonardo Bonucci, 22 Lorenzo Insignie. Unavailable: 1 Gianluigi Buffon (GK), 2 Mattia De Sciglio. Eniola Aluko maintained her impressive scoring streak after her goal set England on their way to a 3-0 World Cup qualifying win in Belarus on Saturday. The Chelsea striker latched onto Fara Williams’ 30th-minute through ball and dinked a shot over Ina Batsianouskaya to break the deadlock in Minsk with her eighth strike of the campaign. Steph Houghton and Lucy Bronze completed the scoring to seal the Three Lions’ seventh straight victory on the road to Canada 2015. Aluko said: “It was a really big objective of mine to start getting on the scoresheet for England. “To look on the scoresheet and see your name on there is obviously really rewarding, something that motivates me to keep doing better. The 27-year-old was paired with Liverpool striker Natasha Dowie up front for the second game in succession. Last time out they each scored a brace as Mark Sampson’s side saw off Ukraine in Shrewsbury. And Aluko is relishing the partnership with her former Charlton Athletic club mate. She added: “It’s nice to play with Natasha again, we played together at Charlton many years back and scored a lot of goals. Aluko continued: “It was good to get the win and another clean sheet. It wasn’t the best performance, Belarus made it difficult for us at times, but we did what we needed to do and got the three points. “Belarus played out from the back and made us press them and try and win the ball back higher up. England require four points from their final three qualifiers to book their spot at next summer’s World Cup finals. They take on Ukraine in Lviv on Thursday, followed by a trip to Wales in August and a final qualifier in Montenegro in September. 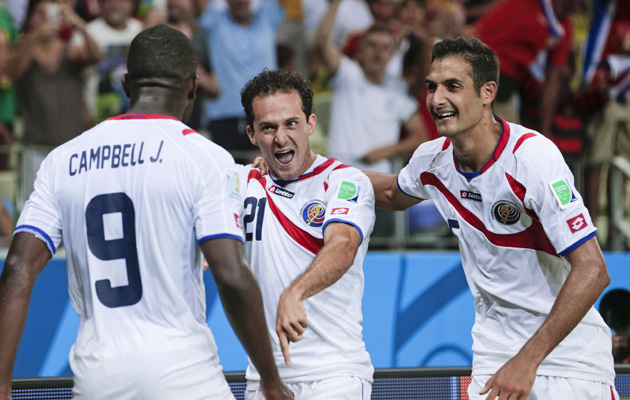 Talking point: Costa Rica the so-called whipping boys of Group D, sprung a huge shock with this performance. Uruguay, without Luis Suarez look a very ordinary side and the fact that Oscar Tabarez was not prepared to risk his star striker in the closing stages of this game raises questions about his overall fitness. 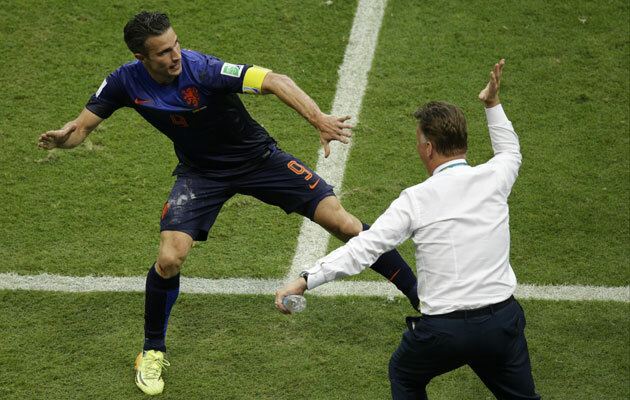 Van Gaal's change of formation set up Holland for their remarkable demolition of Spain. Louis Van Gaal will not be slow to take the credit for Holland's incredible win over Spain. Holland’s extraordinary demolition of Spain in Salvador yesterday is still sinking in. No defending champion has suffered such a disastrous reversal of fortune in an opening game. Spain lost their opening game of the 2010 finals, but it is hard to see them recovering to make the second round this time. The Spanish implosion may have been triggered by a catalogue of errors from Iker Casillas, but credit is also due to Holland coach Louis Van Gaal. His pre-match switch of tactics to a more defensive 5-3-2 gave them a shape and structure to take Spain apart in the second half. Van Gaal, a man not noted for his modesty, will be happy to take credit for the tactical innovations. His teams, from mid-1990s Ajax through to Bayern Munich in 2010, have always played in a 4-3-3. So it was a bold move to change from the conventional Dutch model to a formation which saw Holland play many more long balls than is usual for a Dutch side. It could be argued that 5-3-2 was actually more akin to a Total Football-style 3-4-3. The full-backs were able to push into midfield, as Daley Blind did with great effect on the left against Spain, while Wesley Sneijder, the most advanced of the midfield three, was quick to link with Van Persie and Robben to form a counter-attacking attacking trio. Exciting innovations from Van Gaal, but they were largely forced upon him by the pre-tournament injuries to Kevin Strootman and Rafael Van der Vaart. Had all his players been fit, Van Gaal would probably have stuck with his tried and trusted 4-3-3. However, the reduced midfield options prompted him to play two central midfield protectors in Nigel De Jong and Jonathan De Guzman, with Sneijder in front of them. The full-backs Daryl Janmaat and Blind provided the extra bodies to snuff out the Spanish passing patterns. Robben’s pace and directness, along with some superb individualism from Van Persie, did the rest. The 5-3-2 worked against Spain, with remarkable results, but don’t be surprised if Holland revert to a more attack-minded 4-3-3 in their next match against Australia. 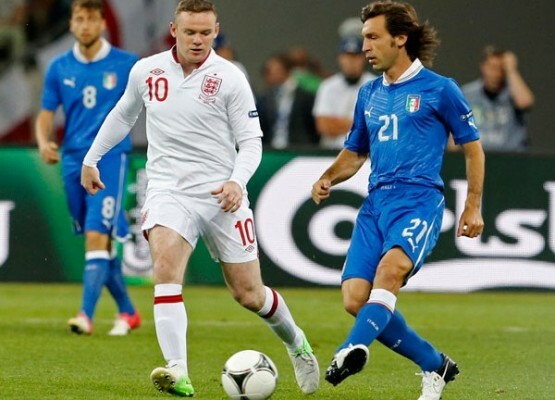 When these sides met at Euro 2012 two years ago, England were passed out of the game by the peerless Andrea Pirlo. Can Roy Hodgson come up with a tactical plan to subdue the midfielder? Since Roy Hodgson took over as England coach, he hasn’t been scared to try out a variety of different formations, often reacting to which players he has at his disposal. His most favoured option has been 4-3-3, a fluid system that also helped disprove the theory that Steven Gerrard and Frank Lampard can’t play together in the same team. However, in Brazil, and particularly for the crunch games against Italy and Uruguay, there will be a need to keep things tight, which could see Hodgson playing two holding midfielders as part of a 4-2-3-1 formation. Gerrard would be one, possibly partnered by Jack Wilshire if he is back to full fitness. Ahead of them would be a deeper-lying Wayne Rooney and a tucked-in wide-man.Adam Lallana is well-suited to the role, although Hodgson is a big fan of James Milner and started him in every game at Euro 2012. Past selections point to an out-and-out winger on the other flank, and with Theo Walcott out injured, this seemingly clears the way for Raheem Sterling. This would leave Daniel Sturridge operating as the lone front man. An even more cautious approach for the team would be a 4-4-2 set-up – Hodgson’s favoured option at club level – but one that drew plenty of criticism when he introduced it for a friendly against the Republic of Ireland last year. The more expansive 4-3-3 formation is likely to be introduced when England are chasing goals, potentially in their final group outing against Costa Rica. This would enable the full-backs, Glen Johnson and Leighton Baines, to push down the flanks, safe in the knowledge that there is always someone to cover in behind them. This would see Rooney adopting a more central role, with Sturridge running the channels down the right. And then, of course, there is England’s more traditional “Plan B” – hitting it long to a big target man. Hodgson isn’t afraid to use it, and it worked for him against Sweden in Euro 2012, but the chances of seeing it in Brazil were reduced when Andy Carroll was left out of the coach’s final 23. By now, foreign observers will have understood that Prandelli’s Italy is not quite the usual defence-oriented, speculative Italy. In agreement with his players, the coach has always wanted to impose a more positive style, with Spain as the ideal role model. However, on the eve of the finals, a realist might suggest that he would be better off resorting to old-style, tried and tested Italian methods. In other words, while he has a more than useful backbone to his team, in the shape of Gianluigi Buffon (injured for the England game) in goal, Giorgio Chiellini and Leonardo Bonucci in defence, Daniele De Rossi, Andrea Pirlo and Claudio Marchisio in midfield. However, his attacking line-up right now represents a major question mark. Mario Balotelli is obviously the main man up front but will he reproduce his Euro 2012 level of performance? Even if he does, it is unclear who will play alongside him. Prandelli likes to play with a positive 4-3-2-1 line-up where the game plan is to knock it around in midfield and wait for Pirlo to either hit a through ball for Balotelli and others, or to score from a free-kick. As always, much will depend on Pirlo, meaning that De Rossi and Marchisio will cover for him, affording him time and space to spray the ball around and keep the team ticking over nicely. If Pirlo is man-to-man marked, then the supply line can break down. Much also depends on the ability of full-backs to provide the attacking options. It is not impossible that Italy may also resort to a classic five-man defence. If Romulo is picked, many will see his last-minute inclusion as a clear indication that Prandelli feels the need to cover himself. A return to defensive methods and a 5-4-1 could see Gabriel Paletta play central defence alongside Bonucci and Andrea Barzagli, freeing up Chiellini for left back. The use of a player like Romulo in midfield could be useful if things do not work out for the unpredictable Balotelli up front, prompting Prandelli to field an inexperienced or lightweight attack (Ciro Immobile, Lorenzo Insigne or SebastianGiovinco) or even recall the mercurial Antonio Cassano. In such a case, Romulo could offer a deal of protection to the overworked midfield trio of Pirlo, Marchisio and Montolivo.